In the current ‘linear’ model, large amounts of non-renewable resources are extracted to produce clothes that are often used for only a short time, after which they are discarded. 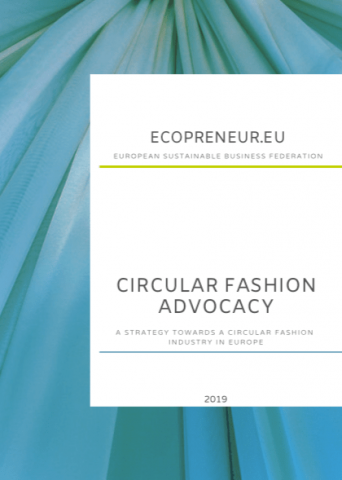 It is time to move fashion towards a ‘circular’ model where clothes, textiles, and fibres are kept at their highest value during use so that they can re-enter the economy and avoid becoming waste. (1) Innovation policies – research programmes with subsidies, investment tax deduction, and support for technological development, innovation and small and medium-sized enterprises. (2) Economic incentives – procurement, extended producer responsibility, VAT, and a tax shift to drive market demand for circular products and services. (3) Regulation – establishing and enforcing a common regulatory framework for transparency and traceability, circular design and improved end-of-waste status across the EU. (4) Trade policies – facilitating export of semi-finished products and sorted, reusable textile waste to producing countries, and avoiding negative social impacts in producing countries. (5) Voluntary actions – covenants, commitments and standards are encouraged to engage stakeholders, with legislation standing by in case of lacking results.